Uglyworld #742 - Recurring Dream (236-365), originally uploaded by www.bazpics.com. The last few nights Poe has been extremely restless, which has unfortunately been keeping several of the other little guys awake too, so today they decided enough was enough and that they wanted to know the reason for his to'ing and fro'ing in bed. Cinko led the interrogation, "Poe, we all knows that you has been movings heres and theres every seconds the last nights, what the hells is making you does this?". Poe answered the question truthfully, "I really don't knows Cinko, honestly's, when I wakes up I remembers nothing". Babo decided that it was time to use the ancient art of Ugly mind-control to put Poe into a sleep-like trance in order to delve deep into Poe's subconscious. Give Babo the powers of Ugly sight"
Poe drifted off into a deep sleep-like trance for a couple of minutes, during which time Babo's hand allowed him to see into Poe's subconscious and the cause of what had been keeping Poe so restless - a recurring dream about being surrounded by Nestle "Crunch" chocolate bars. 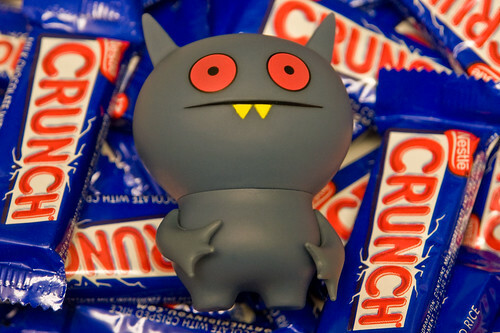 Not only does Babo have a way with words but his skillset never seems to have an end, so to celebrate the fact that they found out what has been bothering Poe they decided to go to the local supermarket and get some Crunch bars to share!